India-based oil refinery plans to grow one million hectares of jatropha to feed a new biodiesel joint venture within three to four years. India's Bharat Petroleum Corp. Ltd. plans to invest nearly $480 million in a joint venture to produce biodiesel from nearly one million hectares of oil-rich jatropha plants in about four years, according to local news reports. The state-run oil refinery will plant jatropha on wasteland in the northern state of Uttar Pradesh to provide feedstock for its biodiesel production, Ashok Sinha, company chairman and managing director, told the Hindu Business Line newspaper Tuesday. That jatropha would be converted to bioiesel by Bharat Renewable Energy Ltd., a joint venture with jatropha grower Nandan Biomatrix Ltd. and construction company Shapoorji Pallonji Co. Ltd., Sinha told the newspaper. Bharat's announcement came soon after the Sept. 11 announcement by India's government of a national biofuel policy that sets a target of having a 20 percent blend of biofuels in all transportation fuels sold in the country by 2017. The new policy also does away with taxes and duties on biodiesel and encourages domestic planting of biodiesel feedstocks through a ban on the import of rendered animal fats and plant-based oils that are common ingredients for biodisel production, according to Green Car Congress. 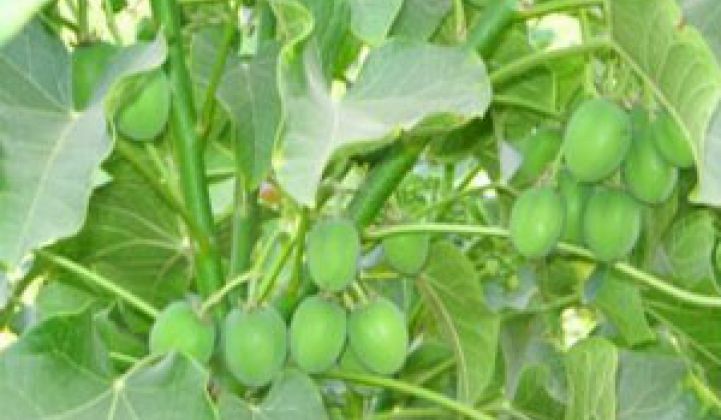 The government encourages jatropha planting on wastelands, rather than on currently fertile or irrigated land, Green Car Congress reported. Biofuel makers are increasingly looking to the non-edible jatropha plant as a feedstock for fuels ranging from biodiesel to jet fuel (see Weed to Power New Zealand Jets, Florida Finds Destiny in Energy Farm). The Uttar Pradesh government will support Bharat's new joint venture, while the cost of planting its jatropha will be paid by a government rural employment program, the Hindu Business Line reported. The newspaper story didn't include the amount of government subsidies. Bharat Petroleum operates crude oil refineries in Mumbai and Kochi, which have a combined annual capacity of 19.5 million metric tons, according to the company's Website.